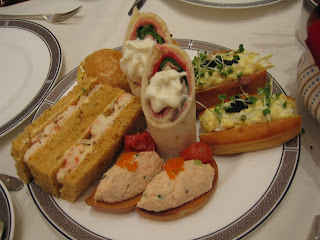 It was with great anticipation that I entered the Langham Hotel in London to enjoy Afternoon Tea last Sunday. My friends and I had booked a table in advance, and we eagerly walked up the majestic steps of the Langham for our first time. We were warmly greeted and shown to our seats – comfortable looking sofas and armchairs round a beautifully laid coffee table. 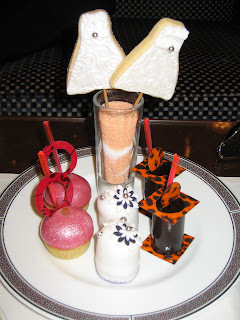 Langham advertise their Palm Court as the place where the tradition of afternoon tea started 140 years ago, and it really was like stepping into a different world, where I could quite happily have stayed for days. 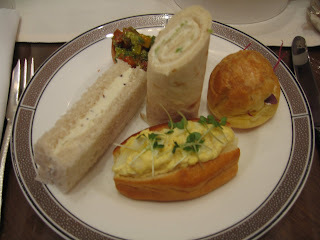 The Tea Guild’s Top London Afternoon Tea 2010 Award was well deserved. We all decided to go for the Tea Royale, which was created in honour of the upcoming royal wedding. Not because we have any special love of royal weddings, but because it looked very tempting, and because it’s on as a special menu this April. The tea sommelier was at hand to give advice about which tea to select and after asking about our preferences she came with some suggestions. I chose the Rose Bud Tisane with my food, a delicious mouth-wateringly delicate drink. The teas quickly arrived, and our cups were constantly, and discreetly, refilled throughout our meal. The first food item to be served was the Royal Champagne Jelly with rhubarb. The rhubarb was perfectly cooked; sweet and soft, and the jelly had retained its intense bubbly champagne flavour through the process of setting – I was very impressed. The jelly served as a gentle palate cleansing introduction to our tea, which was a perfect start for us as we were adjusting to sitting down and relaxing after a morning of ambling through the streets and shops of London. 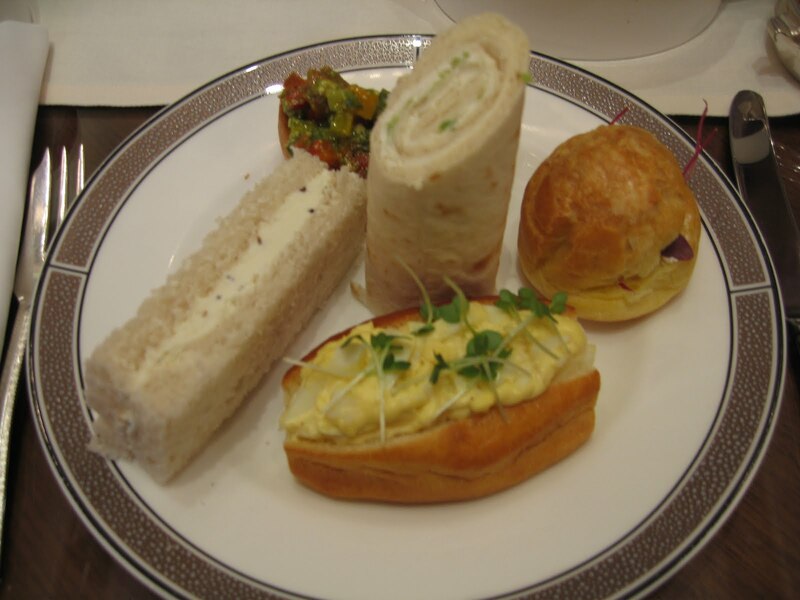 Soon the sandwiches were also brought to our table, a little selection of petite finger sandwiches, including Lobster and cucumber with fennel pollen, Scottish salmon poached in pink Champagne with green peppercorns, and Castle of Mey beef sirloin with horseradish. My menu was adapted to suit me as a vegetarian, so none of the above for me, but instead more of the Truffle and cream cheese gougeres, Duck egg mayonnaise, and Mediterranean vegetables. All beautifully presented and incredibly flavoursome, but not at all overwhelming. And adapting the menu to suit me was no hassle at all; there was no hint of irritation or any feeling of being an inconvenience. Instead our waiter was all smiles and could not have been sweeter or more helpful. After a suitable interval the scones appeared. I already felt quite full at that point, but they were so beautiful I just had to try them. And as soon as they were in my mouth I forgot all about being full, instead I succumbed to the delicate flavours of honey and lavender that melted in my mouth. The scones were served with clotted cream and strawberry preserve, both also delicious. 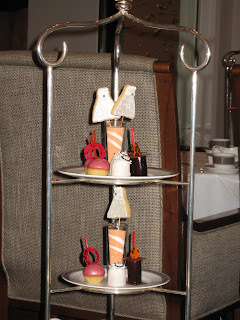 While we enjoyed our scones the desserts were discreetly placed on cake stands by our table. They included a Westminster Abbey chocolate cake, Apricot and raspberry Royal Crown, William and Kate wedding cake and a Kate Couture wedding dress. The cakes were the sort of creations that I can only dream of ever creating, they seemed almost too pretty to be eaten. But only almost. After some admiration the cakes were devoured in silence. Even my friend who did not initially want the desserts had to admit that “those were some really nice cakes”. Praise indeed. After two and a half hours we finally had to very reluctatnly leave our seats to catch our trains home. Not all the scones had been eaten (there were after all two scones for each of us), so we were offered a doggy-bag to take them home so as not to miss out on them. The Tea Royale menu was created by Cherish Finden, the Langham hotel’s Executive Pastry Chef, in celebration of the upcoming royal wedding. I will definitely be going to the Palm Court again to try out one of the other menus. Seats should be booked in advance, as the tea rooms are often full, especially at the weekends.